Serbian President Tomislav Nikolic called on Egypt and all other states to appreciate Serbia's reasons against the recognition of Kosovo's independence, and made it clear that Serbia has a plan for resolving the Kosovo issue. In an interview to Egypt's influential daily Al-Ahram, Nikolic repeated that Serbia will never recognize the independence of Kosovo-Metohija, underscoring that would be against the international law and UN Charter. We are urging all those who should decide on that in any country to think about how they would react if their state were in question, Nikolic said. The Serbian president underlined that he expects Egypt or any other country just to appreciate reasons and evidence that are on Serbia's side. There are some hints that some other Islamic countries could recognize the independence of Kosovo, not because that it is the right move according to the international law, but because of the pressure imposed by major powers, he said. 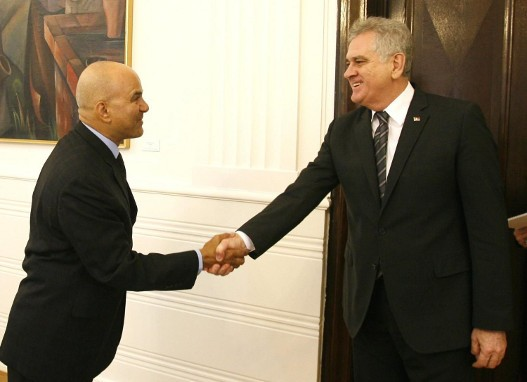 Nikolic noted that the Serbian parliament, upon his proposal, passed the resolution that recognizes Kosovo-Metohija as the specific territory, which could resolve the current situation completely. Under the Constitution, we are not even allowed to recognize Kosovo as some specific territory beyond autonomy, but we have envisaged in the resolution, reckoning that our citizens would approve this through changes to the Constitution, as our citizens are ready to resolve that problem once and for all, he explained. Nikolic said that the government in Belgrade specified certain autonomy for the Serb community within such Kosovo, which implies that members of the Serb community have their police as part of the Kosovo police, their first-instance courts as part of the Kosovo judiciary and their elected bodies as part of Kosovo bodies. However, Kosovo Albanians will not discuss that, as they have the support of the international community for not giving anything, he added. Nikolic reiterated that Serbian Prime Minister Ivica Dacic did not offer Kosovo a seat at the UN, but that he should not have even mentioned it as that is unacceptable for Serbia. The Serbian president noted that out of the 27 EU member states, five have not recognized the independence of Kosovo, and that EU foreign policy chief Catherine Ashton said that Serbia will not be required to recognize Kosovo's independence.